Strawberries and Buttercups: Do you decorate your envelopes? Do you decorate your envelopes? I'm curious to know if you decorate your envelopes for letters to friends. I used to in my teens but once I got into swapping FBs etc... I stopped due to the huge volume of letters I was getting. I often miss it now and have thought about doing it again but I'm worried about things falling off or letters never arriving. I did in August decide to take on an envelope/postcard mini letter friend but this envelope never reached her house so now that I finally have holidays I hope to create a new one soon to resend it to her. Weirdly 2 people sent something to me around the same time as that envelope and I never got them, I feel so disappointed and I'm now at the point where I need to get my act together and get a complaint filed to Royal Mail as the problems have been none stop this year, I've never known anything like it and was always so pleased that my things always arrived to where I sent them. I may one day ask for envelope/postcard friends if things work out well with the one I'm doing but first letters need to reach their destination. Would you be interested in trying this project with me if I do find it is for me to swap handmade postcard letters and envelopes? As you live in England, I would love to write to you! 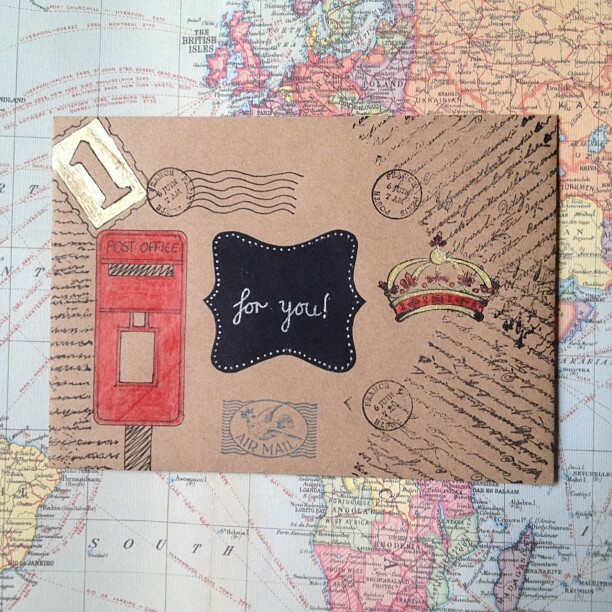 I love "snail mail" and decorated envelopes too...plus you can't have enough letters instead of Junk Mail! It still looks nice with stickers stuck on too. I don't do anything but use fancy tapes. I usually try to decorate the envelopes I sent. My #1 advice is that you should always make sure the envelope is strong enough to make it to its recipient. That's why I protect them with packing tape. I've got a couple of envelopes made with book pages and magazines that were almost torn. It was a miracle I received them, actually. I usually use tape around the edges as that is usually where envelopes are ripped for me but I'll have to start flattening everything with sticky back plastic if I continue decorating my envelopes. I know what you mean about magazine pages too as in my swapping days a lot of people used those and I'd rarely get one that wasn't falling to bits. I love decorate envelopes, I rarely send out any envelopes that have no decoration at all, it's just nice to receive cute envelopes in the mail! I think you just had bad luck with that envelope getting lost. I could be your envelope friend:) I usually paint mine. I'll keep it in mind for if I'd like to continue it. I'm not so sure yet if these mini letters will suit me with writing such long letters. Its just been insane this year for me mail wise that I just want to complain about it which I've never had to do in my whole time snail mail. Maybe things will pick up soon. I've written your letter, I just need to post it but I'll have to remember to do it next time :).